There is a reason that the United States spends 17% of our GDP on health care, when other developed nations spend dramatically less. It’s not because we have a higher quality of care. You can neither cut your way to prosperity nor grow your way out of inequality. I’m an investor, researcher, and the great-grandson of the meatpacker Oscar Mayer. I’m deeply concerned by the extreme inequalities of income, wealth and opportunity that have opened up in U.S. society. Tuesday the Illinois State Senate took a bold step in fighting inequality by becoming the first state chamber in the country to vote in favor of closing the carried interest loophole. The following letter was sent to the DC Council on May 18, 2017 by The Patriotic Millionaires, the DC Chapter of Resource Generation, and Andy Shallal, DC resident and owner of Busboys and Poets. I am outraged. “45” spent his entire campaign claiming that he would stand up for everyday Americans, and yet his recent tax proposals are nothing more than thinly disguised handouts for the wealthy. Not the wealthy…the super wealthy! We have a wage problem in the United States. Our current system is not working. It is harming our economy and money is not going to those who need it most but to the wealthiest. Repealing the ACA tax under Trump’s tax plan will leave a healthcare deficit and is the first step towards ACA repeal, which the Congressional Budget Office reported would kick nearly 24 million Americans off health insurance over the next 10 years. The alternative minimum tax, or AMT, exists to keep very wealthy Americans from using deductions and loopholes to avoid paying taxes. This morning the Patriotic Millionaires took to the streets once again to fight for a fair minimum wage. 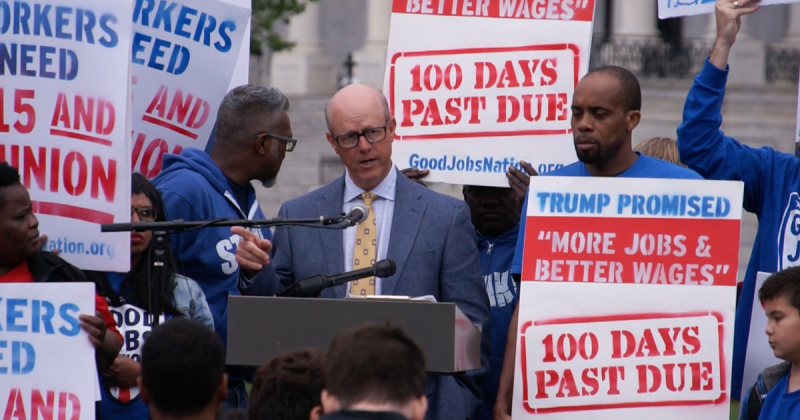 Vice-chair Stephen Prince spoke at a rally to raise the minimum wage alongside Senators Bernie Sanders, Patty Murray, and Chuck Schumer. The purpose of the American minimum wage is to ensure that all Americans are able to earn enough money to provide for the basic needs of themselves and their family. There might be a few legitimate reasons for someone to have a company based out of the British West Indies. Perhaps they happen to be one of the 57,000 people who live there. First, do we acknowledge that inequality has risen to an extreme level? If yes, is there acknowledgment that this is a big problem, if it is not moderated? Tax cuts reduce government services which hurt workers more than the wealthy. This is a form of reverse redistribution–gains for the wealthy, net losses for the working class. This weekend, Patriotic Millionaire Sam Polk is opening the first of hundreds of planned new restaurants that are bringing a whole new model of capitalism to bear on the issue of limited food choices and quality in poorer neighborhoods.